My wife and spent 4 days in mid September. It was the beginning of fall and we got to see the leaves starting to change during our stay, very pretty. 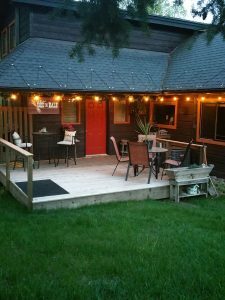 The accommodations were perfect from the convenient location close to town, yet far enough out to appreciate the country atmosphere with deer grazing outside our window to their cows and chickens on the property. There is so much to see in the area (Don't miss Glacier National Park) just a short very scenic drive from the house. The home with such a great rustic cabin feel made it very comfortable to take advantages of all the amenities, having a full complete kitchen, made it possible to stay in to cook dinner or take advantage of all the restaurants nearby. Having fire to sit around outside in the evenings just topped off the special time we had. As most of the previous reviews stated, Linda has thought of everything you would need for a great time at Bailey's Bed 'n Bale.